(Nanowerk News) Researchers from Carnegie Mellon University have developed a novel method for creating self-assembled protein/polymer nanostructures that are reminiscent of fibers found in living cells. The work offers a promising new way to fabricate materials for drug delivery and tissue engineering applications. The findings were published in the July 28 issue of Angewandte Chemie International Edition ("Cooperative, Reversible Self-Assembly of Covalently Pre-Linked Proteins into Giant Fibrous Structures"). "We have demonstrated that, by adding flexible linkers to protein molecules, we can form completely new types of aggregates. These aggregates can act as a structural material to which you can attach different payloads, such as drugs. In nature, this protein isn't close to being a structural material," said Tomasz Kowalewski, professor ofchemistry in Carnegie Mellon's Mellon College of Science. The building blocks of the fibers are a few modified green fluorescent protein (GFP) molecules linked together using a process called click chemistry. An ordinary GFP molecule does not normally bind with other GFP molecules to form fibers. But when Carnegie Mellon graduate student Saadyah Averick, working under the guidance of Krzysztof Matyjaszewski, the J.C. Warner Professor of Natural Sciences and University Professor of Chemistry in CMU's Mellon College of Science, modified the GFP molecules and attached PEO-dialkyne linkers to them, they noticed something strange — the GFP molecules appeared to self-assemble into long fibers. Importantly, the fibers disassembled after being exposed to sound waves, and then reassembled within a few days. Systems that exhibit this type of reversible fibrous self-assembly have been long sought by scientists for use in applications such as tissue engineering, drug delivery, nanoreactors and imaging. "This was purely curiosity-driven and serendipity-driven work," Kowalewski said. "But where controlled polymerization and organic chemistry meet biology, interesting things can happen." The research team observed the fibers using confocal light microscopy, confirmed their assembly using dynamic light scattering and studied their morphology using atomic force microscopy (AFM). 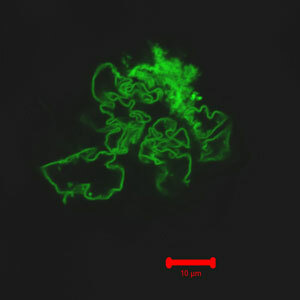 They also observed that the fibers were fluorescent, indicating that the GFP molecules retained their 3-D structure while linked together. To determine what processes were driving the self-assembly, Matyjaszewski and Kowalewski turned to Anna Balazs, Distinguished Professor of Chemical Engineering and the Robert v. d. Luft Professor at the University of Pittsburgh. A leading expert in modeling the dynamics and mechanical properties of mesoscale systems, Balazs ran a computer simulation of the GFP molecules' self-assembly process using a technique called dissipative particle dynamics, a type of coarse-grained molecular dynamics method. The simulation confirmed the modified GFP's tendency to form fibers and revealed that the self-assembly process was driven by the interaction of hydrophobic patches on the surfaces of individual GFP molecules. In addition, Balazs's simulated fibers closely corresponded with what Kowalewski observed using AFM imaging. "Our protein-polymer system gives us an atomically precise, very well-defined nanoscale building object onto which we can attach different handles in very precisely defined positions. It can be used in a way that wasn't ever intended by biology," Kowalewski said.